My husband proposed to me in Greece, overlooking the Aegean Sea, in Sounio, at the Temple of Poseidon. The setting was beyond beautiful and set the stage nicely for a long happy union. It is easy to conjure up the wonderful feeling of being in Greece, the healing sun, the deep blue sea, the white stucco buildings and the simple, but exquisitely flavoured, Greek food. 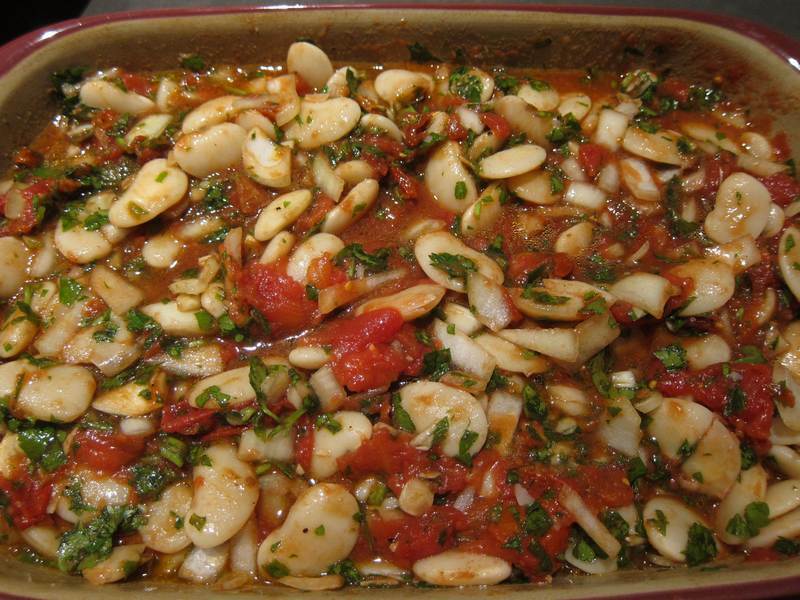 My good friend Mimi Kitner introduced me to this recipe which is as good as the best lima bean recipes in Montreal’s finest Greek restaurants. These lima beans melt in your mouth, hot, cold or in between. This dish can be served as a side dish or frozen in small containers for single servings in lunch bags. It will be my contribution to my 2011 book club, pot luck holiday party. Best of all, it practically cooks itself. Combine all the above and bake, covered, for 2 hours at 350F. Heavily inspired by the spectacular Panache Cookbook, edited by Shawna Goodman-Sone, benefitting the Jewish General Hospital. This is a cookbook worth collecting. Thanks to my good friend Laura Winer, for including me in her book club and for keeping track of all the great books we’ve read over the years. Thanks to udondave, who uploaded the video above. Beautiful spot, well captured. I love Holly’s beans–and like to add some oregano, for flavor as well as for cancer-fighting properties. Supposedly, if you cook the beans with some kombu, a Japanese seaweed, you can mitigate the incendiary after-effects. Of course, I’m not sure how safe Japanese seaweeds are these days (sea vegies can soak up radiation), so you might want to go Indian instead–and end your meal munching cumin or fennel seeds. Or try some Beano. Ironically, foods that give us gas are good for us. We gotta chew them up well before letting them down our gut! Harriet, I love that you watch over all of us like the angel of good health. We can count on you for the facts. Take me to Greece and I will propose to you as well! I need 20 mins. to pack! I wonder if I’d find the drive to blog from there…. Exactly, the taste of molivos chez vous! Mmmmmm..you make them look superb!! Great item to keep in the fridge – (when you’re hungry, with no time to prepare) – they’re great to snack on! What a lovely romantic story. No wonder the recipe is so delicious.